I’m so excited to hear Laura Lippman speak this Sunday at Books in Bloom in Eureka Springs. I intend to be there and pick up a copy of her new book, Wilde Lake while I’m at it. I reviewed After I’m Gone a couple of years ago on this blog, and I’m confident I’ll enjoy her new book just as much. That confidence comes from the fact that I’ve yet to be disappointed with a Lippman story. She is one hell of a storyteller. Her characters are always rich, and her plots very well woven together with surprises along the way. My library includes plenty of Laura Lippman books, and I’ve read a few of them more than once. After I wrote that review and noted that I had the pleasure of meeting Laura Lippman years ago, I was thrilled when she sent me a note stating she remembered meeting me. I attended “Of Dark and Stormy Nights,” a conference held in Chicago by Mystery Writers of America where she spoke. I was absolutely delighted when we happened to share a shuttle to O’Hare Airport at the end of the conference. I talked to her about my book idea, and she told me to go for it, to write the book about a corrupt prison system, a serial killer and a reporter from the Ozark Mountains who puts it all together. That book, A Lovely County, came out last year. The second one in the series is due out in November. Pen-L Publishing is set to release A Lovely Murder in November, and I’m now writing the third one, A Lovely Grave. 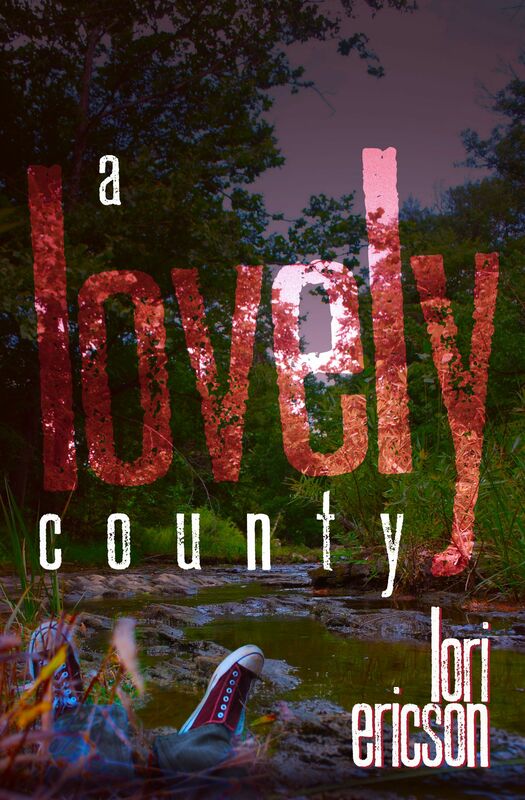 I plan to take a copy of A Lovely County to Lippman this weekend and hope to be able to pass it to her! Wish me luck, because I’d love to personally thank Laura Lippman for encouraging me and teaching me by example about good plotting. 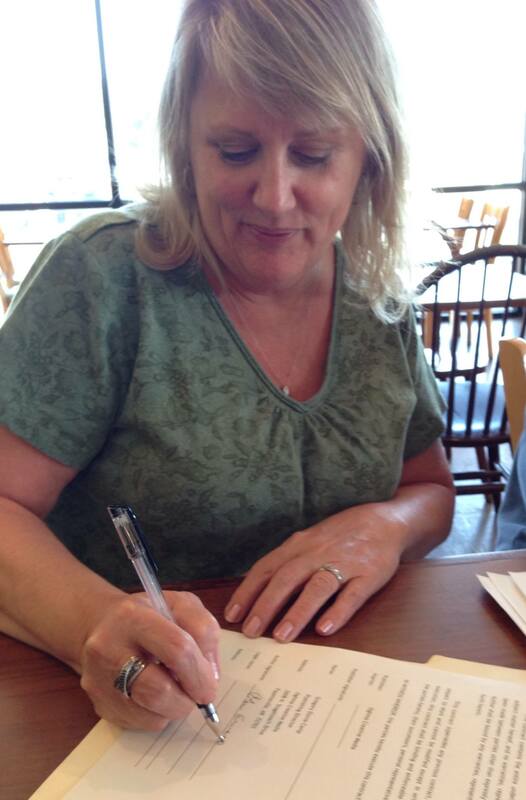 Me signing my first publication contract with Oghma Creative Media. Photo by Casey Cowen, Oghma president. I’d have to admit it took at least two decades. My daughter, now 29 with a child of her own, talks of waking up one morning as a teenager to find me half awake and upset. I told her I’d thrown out the novel I’d started. Yes, I did. I pitched it and started over. That wasn’t the last time either. Now it’s done. It’s hard to believe sometimes that it is. The process was long, but through the stops and starts and restarts I turned into a writer. I had planned to start a second in a series of mysteries with the same protagonist, but while finishing the last edit an idea for a thriller came into my head. I had to start writing it before I burst. That’s just it. I write. I write not because I dream of publication (but nice reward and validation). I write because it’s in me now and to stop would be denying a part of who I am. What am I working on? I’m finishing the editing, rewriting and what seems to be endless changes on a mystery novel about a young Ozarks reporter who’s trying to rebuild her career after being accused of libel. 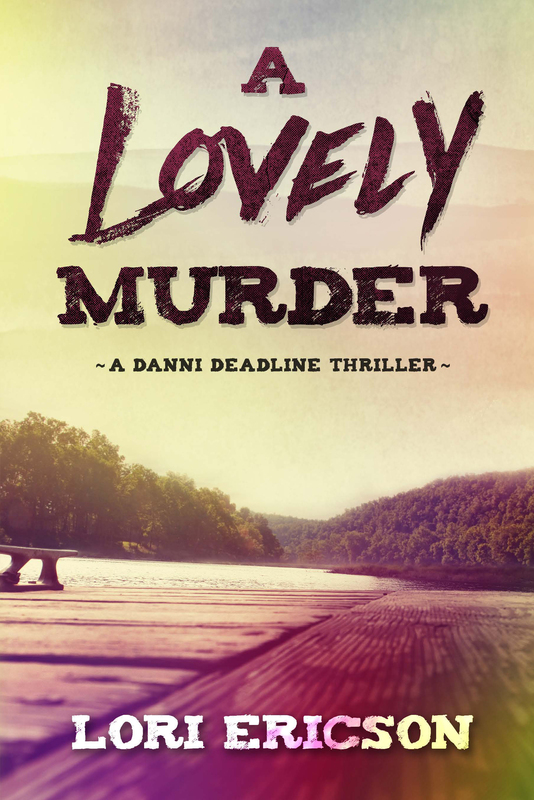 Danni Edens has a chance to repair that damage as she writes a series of articles on a corrupt jail program and a string of child murders; two investigations that have her butting heads with the wrong people who’ll do anything to stop her. But Edens’ personal life brings its own problems with a psychologically troubled mother and a father whose cemetery business is struggling with bad press alleging a ghost is roaming the grounds. How does my work differ from others of its genre? Although my character is much different from me, she comes from a similar background. I grew up in the cemetery my parents owned, and I spent nearly twenty years as a newspaper reporter for both weekly and daily newspapers in the Ozarks of Northwest Arkansas. Why do I write what I do? 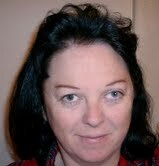 Writing mysteries is a passion for me because I love to read them. I enjoy the twists and turns my characters take, sometimes so unexpected they surprise even me. Some of my short stories lean more towards thrillers. I hope to eventually sharpen those skills enough to try my hand at a thriller novel. How does my writing process work? Like any writer, my writing process starts with an idea. I keep notes on possible characters, clippings from newspaper articles that have sparked an interest and snippets of plot sketches for future stories. Before I start to write, I like to develop that plot sketch with some details about the characters and how they’ll deal with the troubles I’m throwing at them. I’ve had some short stories published, but my biggest problem with a full novel is learning to let go and call it done! I keep finding things I want to change and not finding the time to get them done. This one has to end soon. My second story about reporter Danni Edens is growing in my head and roaring to get on paper. I’m excited to pass the baton for this blog tour on to two very different and fantastic writers. Although one writes fiction and the other non-fiction, and they come from different continents, they share a last name. Alice White and I are members of the Northwest Arkansas Writer’s Workshop critique group together, and Sarah E. White and I once worked for the same daily newspaper. Please check out what they’ll have to say about their writing process next Monday, March 24, and the information below about them both. Sarah E. White writes at Our Daily Craft (http://sarahewhite.com) a blog about crafting with and for kids and creativity for moms and other busy people. 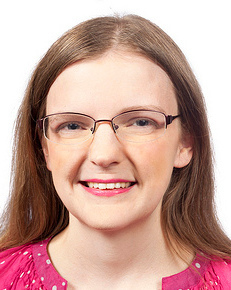 She also writes the knitting websites for About.com (http://knitting.about.com) and Craft Gossip (http://knitting.craftgossip.com) and is the author of two books about knitting, the latest of which, Quick and Easy Baby Knits, was published in August by Stackpole Books. She’s at work on another book for Stackpole, this time on color knitting, which should be out next year. When she’s not crafting or writing about crafts, she enjoys spending time with her husband and their four-year-old daughter.